Bad experiences with construction quality, the energy crises of 1973 and 1979, complaints about "sick buildings", thermal, acoustical, visual and olfactory discomfort, the need for good air quality, the move towards more sustainability - all these have accelerated the development of a field that, for a long time, was hardly more than an academic exercise: building physics (in English speaking countries sometimes referred to as building science). The discipline embraces domains such as heat and mass transfer, building acoustics, lighting, indoor environmental quality and energy efficiency. In some countries, fire safety is also included. Through the application of physical knowledge and its combination with information coming from other disciplines, the field helps to understand the physical phenomena governing building parts, building envelope, whole buildings and built environment performance, although for the last the wording "urban physics" is used. Today, building physics has become a key player on the road to a performance based building design. 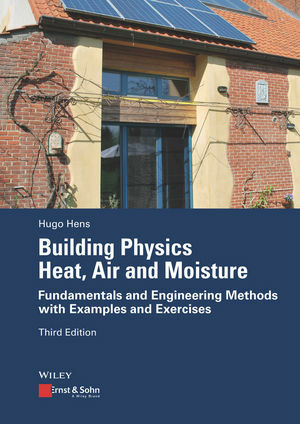 The book deals with the description, analysis and modeling of heat, air and moisture transport in building assemblies and whole buildings with main emphasis on the building engineering applications, including examples. The physical transport processes determine the performance of the building envelope and may influence the serviceability of the structure and the whole building. Compared to the second edition, in this third edition the text has partially been revised and extended. Dr. Ir. Hugo S.L.C. Hens is an emeritus professor of the University of Leuven (KULeuven), Belgium. Till 1972, he worked as a structural engineer and site supervisor at a medium-sized architectural office. In 1975, after defending his PhD thesis, he started the building physics research unit within the Faculty of Engineering of the university. He taught building physics from 1975 to 2003, performance based building design from 1975 to 2005 and building services from 1975 to 1977 and 1990 to 2008. He has authored and co-authored approx. 70 peer-reviewed journal papers and 170 conference papers, has helped to manage hundreds of building damage cases and acted as coordinator of the CIB W40 working group on Heat and Mass Transfer in Buildings from 1983 till 1993. Between 1986 and 2008, he was operating agent of the Annexes 14, 24, 32 and 41 of the International Energy Agency's EXCO on Energy in Buildings and Communities. He is a fellow of the American Society of Heating, Refrigeration and Air Conditioning Engineers (ASHRAE).